This cocktail table will give your living space a touch of rustic design, while also showing off clean contemporary concepts. The piece is crafted from poplar solids and oak veneers in a tobacco finish. Pair that with the ceramic tile top and you have an eclectic and stylish design. As storage goes, you receive two drawers along with an open bottom shelf. Furthermore, this table is castered so you can easily modify your space. Add in custom antique brass pull hardware and this piece becomes even more of a timeless classic to cherish for many years to come. 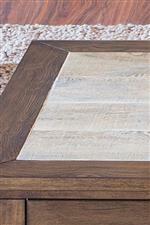 The Mesa Valley Occasional Cocktail Table with Ceramic Tile Top by Liberty Furniture at Van Hill Furniture in the Grand Rapids, Holland, Zeeland area. Product availability may vary. Contact us for the most current availability on this product. Transport your living room to the beautifully rustic southwestern desert with this collection of occasional tables. Boasting tobacco finishes paired with ceramic tile table tops, these pieces will give your home warm and inviting atmosphere. The Mesa Valley Occasional collection is a great option if you are looking for Transitional furniture in the Grand Rapids, Holland, Zeeland area. Browse other items in the Mesa Valley Occasional collection from Van Hill Furniture in the Grand Rapids, Holland, Zeeland area.